I Am That is a compilation of talks on Shiva Advaita (Nondualism) philosophy by Sri Nisargadatta Maharaj, a Hindu spiritual teacher who lived in Mumbai. The English translation of the book from the original Marathi recordings was done by Maurice Frydman, edited by Sudhakar S. Dixit and first published in 1973 by Chetana Publications. The book was revised and reedited in July 1981. These publications led to the spread of Nisargadatta's teachings to the West, especially North America and Europe. Excerpts of the book were published in Yoga Journal in September 1981, the month Nisargadatta died at age 84. The book is considered the author's masterpiece and a spiritual classic by authors and teachers like Eckhart Tolle, Wayne Dyer, Deepak Chopra and Adyashanti, who called the book a "standout" and "the clearest expression I've ever found." Dyer calls Nisargadatta his teacher, and cites the quotation, "Love says: 'I am everything'. Wisdom says: 'I am nothing'. Between the two my life flows." That quotation has also been cited by several other authors in diverse fields, from wellness to cooking. Joseph Goldstein visited Nisargadatta in January 1980 after reading the book, and after several meetings said, "The path that Nisargadatta revealed was not a search, but a find, not a struggle, but an abiding, not a cultivation, but something intrinsic to all". I Am That has been translated into several languages, including Dutch, Italian and Hebrew. Nisargadatta Maharaj met his guru, Siddharameshwar Maharaj, in 1933. Siddharameshwar died two and half years later, and Nisargadatta continued to practice what his guru had taught him while running a small shop in Khetwadi locality in Girgaon, Mumbai. In 1951, after receiving an inner revelation from his guru, he began to give initiations. He allowed devotees to gather twice a day for satsang, with meditation, bhajan-singing, and the answering of questions, continuing until his death on 8 September 1981, at the age of 84. Maurice Frydman, a Jewish refugee from Warsaw, came to India in the late 1930s. Initially, he worked at the State Government Electric Factory in Bangalore. Later, influenced by Mahatma Gandhi, he worked in Aundh State (the present Satara district) on the Aundh Experiment for local self-governance. Thereafter he took sannyas (renunciation). He was associated with Sri Ramana Maharshi and J. Krishnamurti. Eventually he became a disciple of Sri Nisargadatta Maharaj in the early days of Nisargadatta's spiritual work in 1965. Frydman spoke Marathi and so became a translator of Nisargadatta's talks. He recorded and compiled the sessions, leading to the publication of I Am That. Most of the conversations were in Marathi, but for the benefit of Westerners talks were often translated. Frydman: ″Whenever I was present the task would fall to me. Many of the questions put and answers given were so interesting and significant that a tape-recorder was brought in. While most of the tapes were of the regular Marathi-English variety, some were polyglot scrambles of several Indian and European languages. Later, each tape was deciphered and translated into English″ . All the conversations were recorded at Nisargadatta's small tenement and later transcribed and translated by Frydman while the master was still unknown to the Western public. A Marathi version of the talks, verified by Nisargadatta, was published separately. According to Nisargadatta, "Maurice (Frydman) told me, 'Everything that is said here is immediately lost, though it could be of a great benefit for those looking for truth. I would like to translate and publish your words so others might know them. And so, he wrote I Am That". I Am That was initially rejected by the major publishers, so Frydman worked with a then small publisher, Chetana Publications. The book was first published in 1973 in two hardcover volumes. The revised and enlarged second edition was published in one volume in 1976. The first paperback was published in 1984. The book is now published in the USA and Canada by The Acorn Press. The book comprises 101 sections, each corresponding to a particular conversation, averaging four pages each and cast in a question-and-answer format. Most deal with a single issue but some go from one subject to other, always in line with the spiritual quest. The second edition includes an epilogue, Nisarga Yoga, by Maurice Frydman. Hindi edition of the book. Nisargadatta's teachings are grounded in the Advaita Vedanta interpretation of the Advaita idea Tat Tvam Asi, literally "That Thou Art", (Tat = "Absolute", Tvam = "You", Asi = "are") meaning "You are (actually) Absolute" (who think otherwise). Nisargadatta also had a strong devotion to his own guru, and suggested the path of devotion, Bhakti yoga, to some of his visitors. 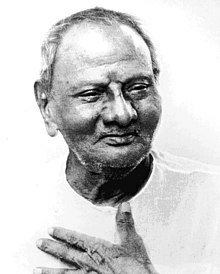 Nisargadatta deviated from the formal Navnath Sampradaya lineage style of teaching by giving informal discourses for the benefit of Western devotees who did not have access to Dasbodh or other texts, and who were not familiar with Indian traditions and customs. It has been said that Nisargadatta´s style was direct, and even at times aggressive. He very rarely mentioned scriptures or quoted spiritual books. His teachings came from his own experience. Nisargadatta taught what has been called Nisarga Yoga (Nisarga can be translated as “the natural state”). In I Am That, Nisarga Yoga is defined as living life with “harmlessness,” “friendliness,” and “interest,” abiding in “spontaneous awareness” while being “conscious of effortless living.” The practice of this form of Yoga involves meditating on one’s sense of "I am" or "being" with the aim of reaching its ultimate source, which Nisargadatta called the Self. According to Nisargadatta and others one of the main blockages to self-realization is identification with the body. “Once you give up your identification with the body, then you are all the time the Self, or Atman, only. For this, no effort is required. You only have to realize that you are not the body”. A most suitable way to drop the identification with the body is to focus in the source of consciousness, the feeling “I am”, which is not the body, the thoughts or anything observable. According to the sage of Mumbai whatever happens happens because “I am”; even if you doubt that, you have to be there to doubt. “Yes, sadhana (practice) consists in reminding oneself forcibly of one's pure 'being-ness', of not being anything in particular”. “Empty yourself”, “surrender” or “give up everything” is the advice to many visitors. Whatever your path is it ends with complete surrender to the truth. Conceptual knowledge cannot help the student progress. According to David Godman, Nisargadatta “would clench his fist, bang it on the floor and shout ‘Kalpana! Kalpana!’ which means ‘Concept! Concept!’ That would sometimes be the only answer the questioners would get. Maharaj was definitely not interested in massaging visitor’s concepts. He wanted people to drop them, not discuss them”. Throughout the book the master insists on earnest, zestful work towards spiritual progress and final attainment, liberation or Moksha; “Earnestness is the sign of maturity”. “You may choose any way that suits you; your earnestness will determine the rate of progress”. Nisargadatta does not quote other teachers in the book, but a few are mentioned by his visitors, Ramana Maharshi being the most significant. ^ "I Am That: Talks with Sri Nisargadatta Maharaj". Goodreads. Retrieved 2014-08-18. ^ a b Constance Jones; James D. Ryan (2006). Encyclopedia of Hinduism. Infobase Publishing. pp. 315–. ISBN 978-0-8160-7564-5. ^ Morgan Zo-Callahan (2009). Intimate Meanderings: Conversations Close to Our Hearts. iUniverse. pp. 485–6. ISBN 978-1-4401-3659-7. ^ Igor Kononenko (2010). Teachers of Wisdom. Dorrance Publishing. pp. 293–. ISBN 978-1-4349-5410-7. ^ Douwe Tiemersma (2012). Non-Quality: The Groundless Openness. John Hunt Publishing. pp. 51–52. ISBN 978-1-78099-289-1. ^ I am That: Conversations with Nisargadatta Maharaj (Conversation 98). Yoga Journal. Active Interest Media, Inc. October 1981. pp. 50–51. ISSN 0191-0965. ^ a b Wayne W. Dyer (2007). Change Your Thoughts - Change Your Life. Hay House, Inc. pp. 39–. ISBN 978-1-4019-2052-4. ^ Adyashanti (1 September 2006). Emptiness Dancing. Sounds True. pp. 192–. ISBN 978-1-59179-876-7. ^ Maria Amore (17 April 2014). Cooking with Amore. AuthorHouse. pp. 120–. ISBN 978-1-4918-7007-5. ^ Jenny Gallagher (1 April 2011). Yen Path: Taking Steps Towards What You Want in Life. Price World Publishing. pp. 69–. ISBN 978-1-936910-69-4. ^ Rodney Smith; Joseph Goldstein (2010). Stepping Out of Self-deception. Shambhala Publications. pp. xv. ISBN 978-0-8348-2296-2. ^ "I Am That talks with sri nisargadatta maharaj'". WorldCat.org. Retrieved 2014-08-20. ^ "Translation of I AM THAT - the most famous book of Nisargadatta Maharaj into various languages". Nisargadatta.org. Retrieved 2013-07-31. ^ "Sri Nisargadatta Maharaj, Life and Teachings". Retrieved 2014-09-27. ^ Alter, Joseph S. Gandhi's Body. University of Pennsylvania Press, 2000. ISBN 978-0-8122-3556-2. p. 92. ^ a b "Chapter 6 With Nisargadatta Maharaj for Maurice Frydman- a Jnani and a Karma Yogi". Dr Srinivasan Nenmeli. 2012. Retrieved 2013-07-31. ^ "The Style of Teachings of Sri Nisargadatta Maharaj". Nisargadatta.org. Retrieved 2013-07-31. ^ "RANJIT MAHARAJ | meeting siddharameshwar". Inner-quest.org. 2013-07-13. Retrieved 2013-07-31. ^ "Remembering Nisargadatta Maharaj". Davidgodman.org. Retrieved 2013-07-31. ^ Hur Guler (1971-09-05). "Nisargadatta Maharaj". Nisargadatta.net. Archived from the original on January 27, 2016. Retrieved 2013-07-31. ^ Nic,, Higham,. Living the life that you are : finding wholeness when you feel lost, isolated, and afraid. Oakland, CA. ISBN 9781684030859. OCLC 994000117. ^ "Nisarga Yoga". nisargayoga.org. Retrieved 2018-07-24. ^ "Nisargadatta Maharaj-My Recollections". Enlightened-spirituality.org. Retrieved 2013-07-31. ^ I Am That, chapter 16. Stephen H. Wolinsky (2000). I Am That I Am: A Tribute to Sri Nisargadatta Maharaj. Quantum Inst. ISBN 0967036259. Nisargadatta Maharaj; Jean Dunn (1990). Prior to Consciousness: Talks with Sri Nisargadatta Maharaj. Acorn Press. ISBN 978-0-89386-024-0. Nisargadatta Maharaj; Robert Powell (2006). The Ultimate Medicine: Dialogues with a Realized Master. North Atlantic Books. ISBN 978-1-55643-633-8. Nisargadatta Maharaj; Vasistha (2010). The Seven Steps to Awakening. Freedom Religion Press. ISBN 978-0-9797267-6-7.